On October 11, tvN’s new drama “Revolutionary Love” released behind-the-scenes stills of Choi Siwon, Gong Myung, and Kang Sora on set. Choi Siwon and Kang Sora have good chemistry as a rom-com couple, their different personalities clashing and complementing each other. 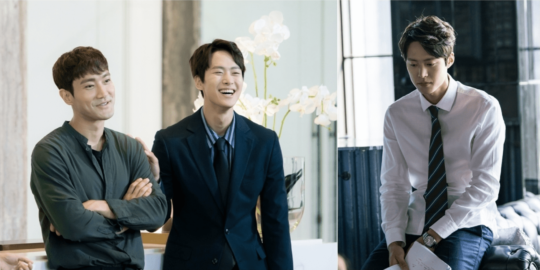 The three actors, including Gong Myung, have fun off-camera as well, smiling in the candid cuts and making playful faces at the camera even if the characters they play have a more serious bent. However, all the actors take their roles seriously, reviewing scripts even while making faces at the camera and conferring with the production staff. Gong Myung’s script was even reported to be full of memos and ideas about his character. “Revolutionary Love” tells the story of a down-on-his-luck third-generation chaebol heir (Choi Si Won), a highly educated and highly qualified woman forced to make a living on part-time jobs (Kang Sora), and an elite company member dreaming of becoming part of the 1 percent (Gong Myung). The first episode is slated to premiere on October 14 at 9 p.m. KST.